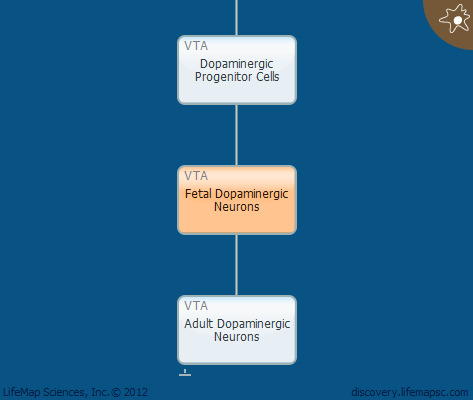 Mature ventral tegmental area (VTA) dopaminergic neurons migrate to their final destination in the ventral midbrain, and begin to express mature dopaminergic markers such as Pitx3, TH,Slc6a3 (DAT) and Slc18a3 (VMAT2). Dopaminergic neurons in the VTA innervate the ventromedial striatum and prefrontal cortex (PFC) and are involved in the regulation of emotions and reward. Defective dopaminergic transmission in these pathways has been implicated in the development of drug addiction, depression and schizophrenia. During embryonic life, VTA neurons non-specifically project to different regions of the striatum and the PFC. Refinement of this innervation and its limit to the ventral striatum and the forebrain occur during post-natal stages. Substantia nigra pars compacta (SNC) and VTA dopaminergic axons take a ventro-rostral course through the diencephalon towards the telencephalon. Following their exit from the midbrain, individual axons fasciculate into two large axon bundles, called the medial forebrain bundles (MFBs).